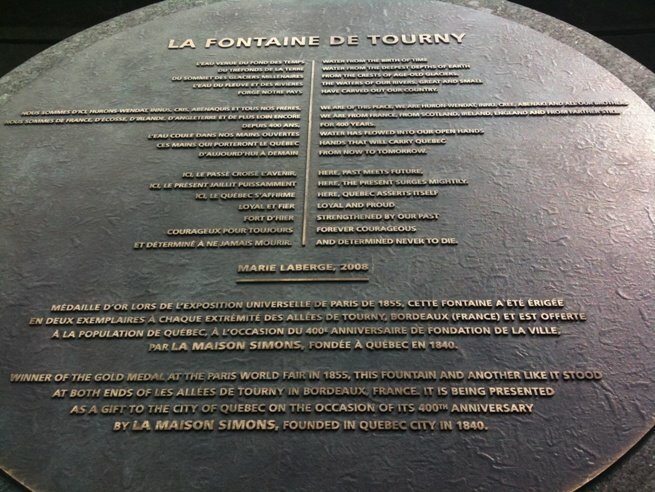 Fontain with a poem by Marie Laberge on one side. The base of the fountain lies in a circular granite basin. The fountain features sixteen frogs and four statues around the octogonal pedestal holding the bowl, which is decorated with fishes each of its eight sides. The water is projected upwards by the frogs. HAVE CARVED OUT OUR COUNTRY. WE ARE FROM FRANCE, FROM SCOTLAND, IRELAND, <1>ENGLAND AND FROM FARTHER STILL. HERE, THE PRESENT SURGES MIGHTILY. AND DETERMINED NEVER TO DIE. Et déterminé à ne pas mourir. The fountain dates back to the mid-19th century. Commissioned by the mayor of Bordeaux, France, to celebrate the arrival of running water in the city, the fountain and five others like it would stand at both ends of the Allée de Tourney up until the 1960s. 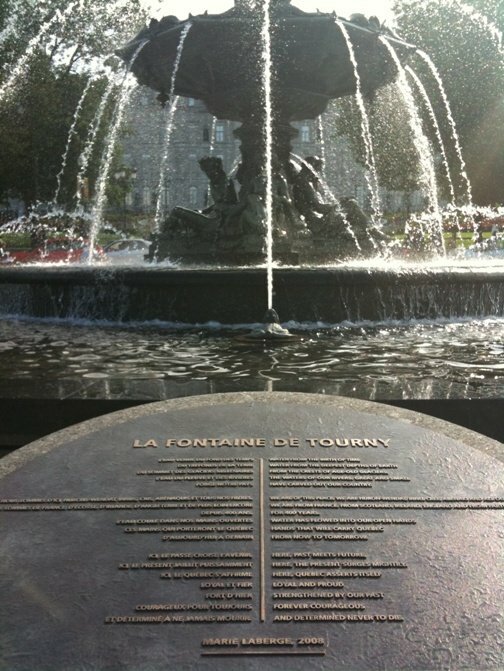 Produced in the famous Barbezat art foundry, the Fontaine de Tourny was designed by sculptor Mathurin Moreau, who won gold for his work at the Paris World Fair in 1855. The ornaments evoke the imaginary world of the sea. The fountain is being presented by La Maison Simons as a gift to Quebec City for its 400th anniversary. Five similar fountains can be found in Europe, in the cities of Porto, Angers, Soulac, Saint-Quentin and Geneva. The mechanical room is located below ground level and contains the control panels. Five pumps feed the fountain with a flow of 100 litres per second (1,600 gallons per minute). The fountain works with a continuous flow of water; additional water is pumped only to compensate evaporated losses. An anemometer (a camera hooked to a pole located near the fountain) measures the speed of time and allows for the adjustment of the jets according to wind forces in order to avoid splashing passers-by and the formation of ice on the pavement. 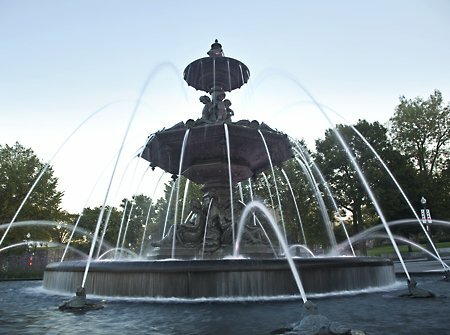 The fountain is active from May to October. Québec Inaugure La Fontaine De Tourny, Don De La Famille Simons.